I am from Democratic Republic of Congo ,Curently Student in the Faculty of Medicine at Federal University of Minas Gerais (Brazil) and President of Administrative Council of a Congolese non for-profit Organization SOLIDARIEDADE NA MOKILI ( http://www.solidariedadenamokili.org ) , I am always influenced and interested in the development of vulnerable women, victims of armed conflicts in Congo and vulnerable children . These people face difficulties in accessing finance, lack of support services, regulation Unsuitable , social prejudices, heavy family responsibilities and low educational attainment are the main obstacles for women in the Democratic Republic of Congo.The acording UNICEF , Issues facing children in the Democratic Republic of the Congo Rates of infant, under-five and maternal mortality are staggering. One in seven children dies before reaching the age of five. Mothers die in childbirth in 13 out of every 1,000 deliveries. Less than one third has access to adequate sanitation facilities. The HIV/AIDS prevalence rate among 15 – 45 year olds is 1.3 per cent overall with some geographical disparities. The rate is 1.6% among women and 1.9% in urban. 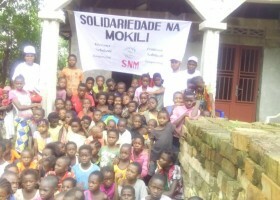 Than I create non profit Organization SOLIDARIEDDE NA MOKILI to invest to these people in Democratic Republic of Congo and others people with the same profile around the World by : Providing humanitarian assistance without discrimination of religion, Race, philosophy or politics opinion. Promoting the healthcare in the preventive, curative and palliative aspects; Ensure the education for the vulnerable children ;Organize lobbies and raise awareness of socio-humanitarian issues in favor of changing the living conditions of the poor; Ensure respect of human rights and equality between men and women;Ensure the food and nutritional security of the population in precarious situations;Ensure environmental sanitation, fight against VIH/AIDS. Guidance to set up representative office where this project will operate across 27 countries with high burden of Malaria in Sub-saharan Africa(Angola ,Benin ,Congo (Brazzaville) , Ivory Cost ,Ethiopia ,Ghana ,Guinea ,Kenya ,Liberia ,Madagascar ,Malawi ,Mali, Mozambique ,Nigeria ,Senegal ,Tanzania ,Zambia ,Zimbabwe) ,Greater Mekong Subregion(Cambodia ,Burma ,Thailand ,LAO PDR ,Vietnam) and Americas( Brazil ,Colombia ,Peru, Haiti), Although the Center will be based in Kinshasa, my members will work overseas and will conduct malaria research in over 27 countries at any one time with the help of TELEMEDICINE that will be usefull to connect them each others ; I m looking for Partners in order to tackle this big challenge and to be linked with possible funders for financial support to realize this project essencial for the achievement of many Sustainable Development Goals (SDGs). I m Student in Medicine at Federal University of Minas Gerais (UFMG ) and President of administrative council of a non profit organization SOLIDARIEDADE NA MOKILI.I have a capacity of leadership that involves a fast faced atmosphere to the development of SOLIDARIEDADE NA MOKILI ‘s relationship with its environment, and in particular: decision-makers in economic and social development; The banking sector; The academic world and the network of external partners. I examine the programs of activities presented to the Executive Secretariat in accordance with the guidelines laid down by the General Assembly.I have the recognition in Gungu with my organization to be the first with humanitarian action never seen before by the Administrator of territory Tresor Kitambala.I was selected in the commemoration of 90 years of the Federal University of Minas Gerais as people who marked with their experiences lived in the University and that also left their mark by changing the world to better place .